I’m always on the look out for any exercise regime that is easy, burns loads of calories, is fun and is also kind on my back (I have a lower back injury). So, when my mom mentioned rebounding to me, I wasn’t totally convinced, you would think that 34 years on, I would realise that my mom knows everything. But, after some online research, I was very keen to give it a try, but before I went out and bought a rebounder, I wanted to find a class where I could give it a try. And, that’s how I stumbled onto Lisa Raleigh’s website. 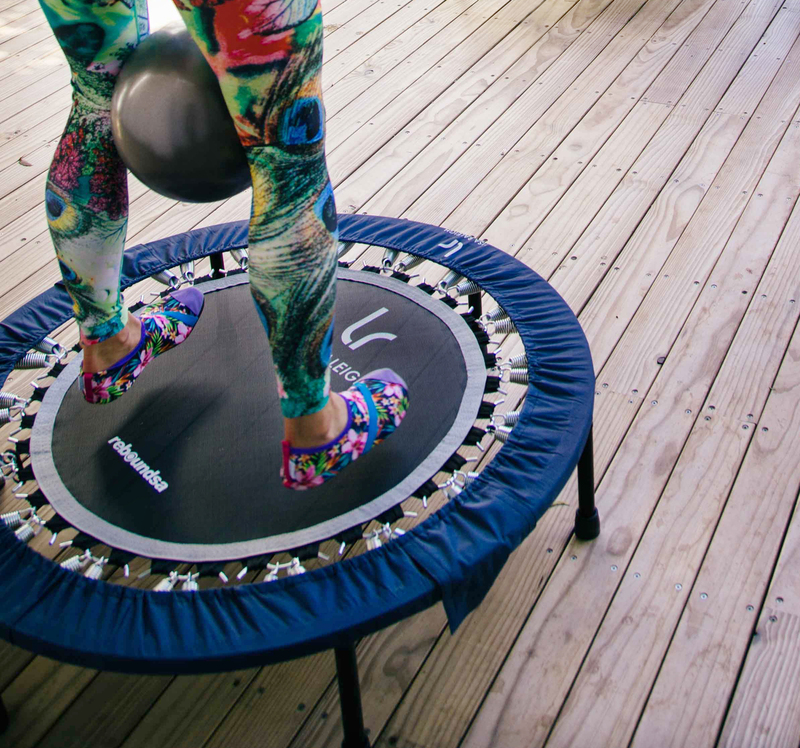 It is a form of low-impact exercise that is performed on and using a rebounder, which is a mini trampoline. A variety of movements are used to try and get an intense full body workout. Movements such as twisting, jumping, squats, etc are all incorporated. If you want to get a better idea of what all can be done, as you will be amazed how much you can actually do on a rebounder, watch a few video’s on Lisa Raleigh’s YouTube channel. What benefits does Rebounding have? 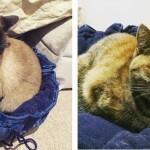 The benefits of rebounding are endless, the more I researched this topic the more I realised that there are more than I could list in this blog post. And, believe me, if you google benefits of rebounding, you will spend hours reading thousands and thousands on articles on the benefits. It’s a fun way to lose weight…which is so true as it torches calories like you can’t believe and really gets your heart pumping. For me, in general, I burn around 450 calories in a 30 min workout and my average heart rate is around 150bpm. Improves balance & co-ordination…I’ve only done 3 Rebounding classes with Lisa and 3 on my own and I can already see how much progress I have made with my balance & co-ord. 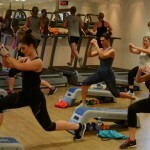 I’m normally the idiot going the wrong way or putting my arms up when they are meant to be down in an aerobics class (which is why I avoid them like the plague)…so if I can manage most of the rebounding moves then you all will be fantastic. It’s easy on your joints with little impact…which for me is a huge plus as I have a lower back injury, so having minimal impact is really important for me. I mean don’t get me wrong, I do other forms of exercise like cycling and cross-training but I do find that Rebounding doesn’t put as much strain on my back. Body Detox…it gets your lymphatic system up and running, which means its a great way to start your day! Rebouding flushes the lymphatic system by the constant up and down movement of jumping. Reduces Cellulite…I mean who wouldn’t want this! So this is how it works – cellulite is frequently caused by a stagnant lymph system, by increasing the lymphatic flow in your body, rebounding can reduce one of the factors that causes non-hereditary cellulite. 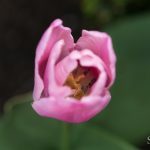 Improved Immune System…after the winter we have had, and being on 4 sets of antibiotics, this is a pretty important benefit for me. Rebounding helps to boosts your immune system by stimulating the action of red bone marrow and supporting the repair of tissue. Where can I try a Rebounding Class? 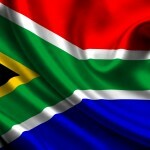 As I live in Joburg, I only know where you can try a class here, but I am sure there must be places in other cities. I’m sure I could find some on Google, but I really don’t want to recommend places I haven’t personally been. Ok, so now you are intrigued like I was about Rebounding and want to know if it’s for you or not. Well, if you are in JOBURG, then you can try one of Lisa Raleigh’s Rebounding Classes in Parkhurst. All I am saying is be ready to be addicted! After trying her class, I not only bought another 10 classes but I also bought one of her rebounders. Lisa brings such an energy to her classes, she really makes you want to be there. The classes are challenging but fun and are for all fitness levels. 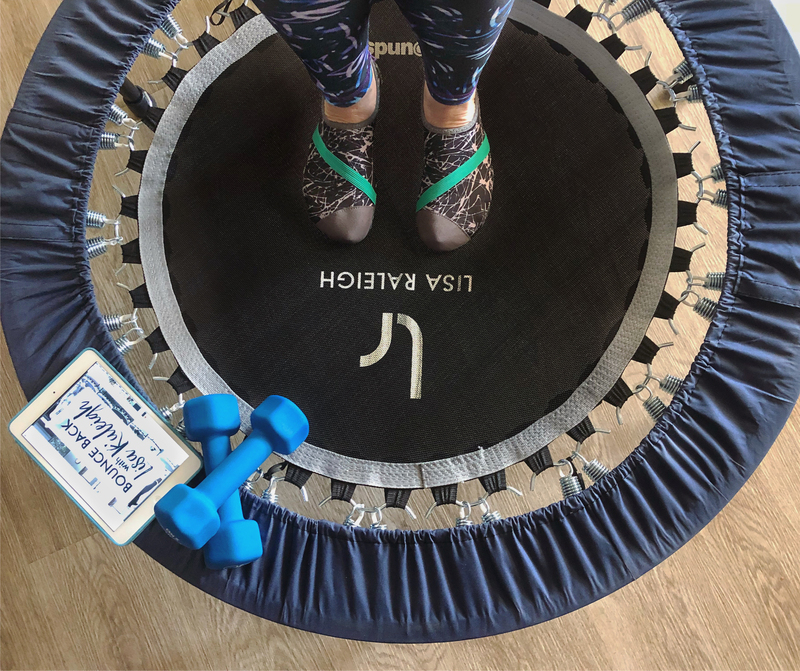 Be prepared to do a whole range of full body exercises on the rebounder, such as jumping jacks and also some off the rebounder using it as surface to balance on, such as push ups. The thing I probably liked the most is, Lisa made me feel at ease and actually really good about myself by telling me that I did well and that with time I will get better and more confident on the rebounder. She was totally right, my next class was amazing in comparison…I felt like I was definitely improving. Lisa always encourages you to do the best you can and is more than happy to chat to you after the class about any concerns you might have. In a way, she makes you feel like you are friends, rather than just taking a fitness class. So, if you want to book one of her classes, visit her website – https://lisaraleigh.com/ where you can choose to do a drop in Bounce Back class. You can also browse her online store for a rebounder, weights, fitness videos, etc. 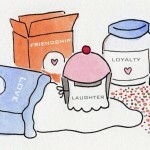 Lisa Raleigh has all sorts of interesting things in her online store. Lisa is well-known for being the blue team trainer on SA’s The Biggest Loser, as well as, a wellness consultant on SABC 3’s morning Expresso show. Now, she also runs her own health and wellness consultancy. Lisa shared her story on what got her started with rebounding, “Rebounding has changed my life in so many ways. It’s made me fitter, stronger, healthier and happier. You just can’t help but smile every time you bounce! 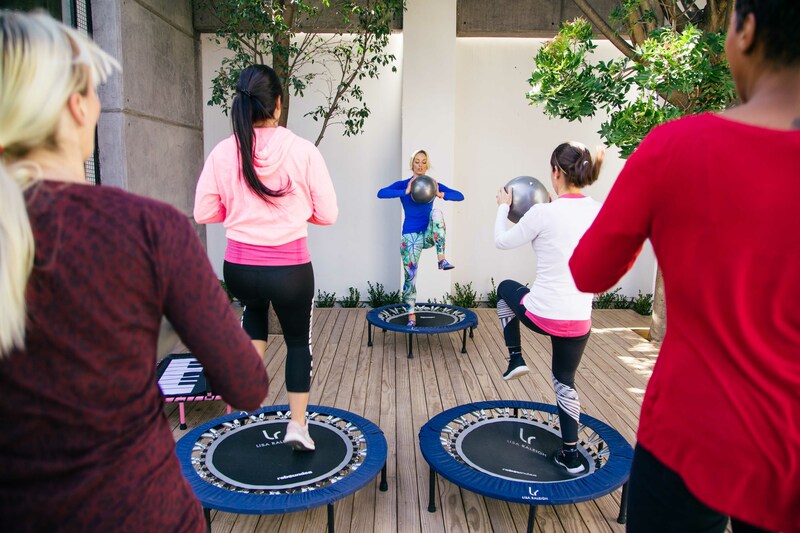 Although I’ve always used a rebounder, it was only after having my daughter Bella, that I discovered what a miracle exercise it truly is – and I began to bounce most days of the week. Just a few minutes of rebounding a day helped me to regain strength in my core and pelvic floor, I lost my baby weight with minimal effort, and I worked muscles I didn’t even know I had!”. 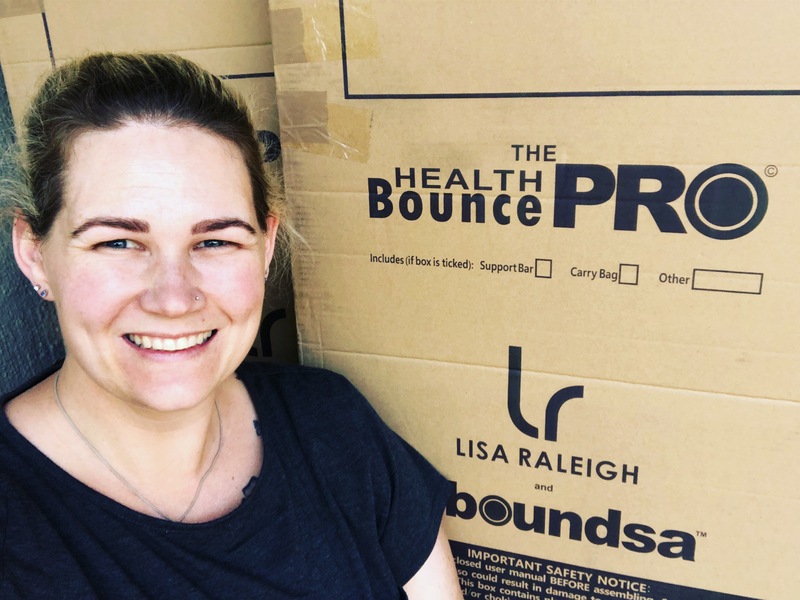 Lisa Raleigh has developed a series of safe, fun but challenging rebounding workouts, that you can purchase and then follow in the comfort of your own home. I have a whole load of them and can say that my favourite are in the 30-40 min bracket. And, you don’t have to worry, they are easy to follow and lots of fun. I use an iPad stand and watch on my iPad, but you can stream them to your TV if that works better for you. And, you really don’t need much, a rebounder, a set of light weights, a pilates ball and a resistance band. But, to be honest, you will still see great results if you just use the rebounder and not the other fitness equipment. Not all rebounders have been created equal. And, I’m not here to berate or run down any brand. I’m merely just giving you my experience. I personally have not tried a cheaper rebounder, but my mom currently has one, and she said to me it’s not as stable as the ones Lisa Raleigh sells. So, she doesn’t feel comfortable or safe doing any exercise where you only have 1 foot on the rebounder at a time. This is the main reason, she decided to get a new one. So my advice to you is make sure you are getting the best quality one you can afford. I personally have one of the Lisa Raleigh’s rebounders and I’m not a small girl, and I am confident jumping on it, as it feel sturdy and stable. At no point have I ever felt like it might break under me. The other thing that is great about the one Lisa Raleigh sells, is that it can be folded in half, which means it can easily be stored anywhere, including under a bed and it also makes it portable…FYI – You can get a carry bag for it – my next purchase! *Please keep in mind, that I am not medically or fitness trained in anyway, I am merely sharing my personal experience with regards to Rebounding. If you are currently not exercising or unsure, please speak to your doctor before starting an exercise program.